Saint Anthony Hospital will host its annual community Summer Fest Car and Bike Show on Saturday, June 7, 11a.m. to 4p.m. The annual event will be filled with entertainment, wellness activities and education for the entire family, including health screenings by Saint Anthony Hospital certified staff, free back-to-school physicals, vaccines, eye exams and glasses, and information on over 40 of our community partner organizations. The event will also feature a wide variety of family entertainment options. •	Children can enjoy participating in the Gads Hill Play Streets Program. The Play Streets Program will be offering a fitness challenge and short workshops on nutrition. •	West Town Bikes will be hosting a safety presentation where participants can qualify to win a bike. •	Families will also be entertained by RADIO VIVE, Tumbling for Success, an acrobatic performance group started by a former Jesse White tumbler, and event guests will have an opportunity to meet the Chicago Wolves’ Skates, Chicago Blackhawks’ Tommy Hawk, Chicago Sky Guy and much more. Senator Napoleon Harris who played for the Oakland Raiders, Minnesota Vikings and Kansas City Chiefs in the NFL will be signing autographs. All families that pre-register receive a FREE school bag for each child for the upcoming school year. 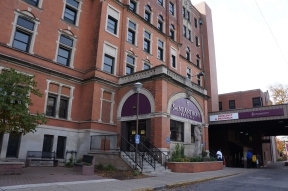 To learn more and RSVP call 773.484.4FUN (4386) or Facebook.com/SaintAnthonyHospitalChicago.